The Deburring System DS integrated, is a deburring cell with part feeding, an optimized system geared on throughput, process reliability and complete automation for post-processing of mechanically produced workpieces. Compared to the base model, DS integrated is equipped with an additional shuttle table or a rotary table. The deburring cell is ideal for deburring, 3D-trimming and drillings as well as brushing. It has already proved its value in the aerospace industry as well as in the automotive and supplier industry. Even complex components of mixed origins can be processed with DS integrated by gKteso, problem-free and at a high throughput. In combination with its 5-axis technology, the application range includes even most complex geometries and form elements. Only production companies delivering high quality at reasonable cost will have a chance in the international market. Therefore, it will be increasingly important for companies to optimize all production processes, such as the removal of burrs at the edges of workpieces, caused by material displacement during milling, punching or turning operations. In metal and plastic processing industries, such as car manufacturinc, aerospace, mechanical engineering, foundries and two-wheel industry, edges on workpieces were formerly often removed manually. Combined with deburring cells by gKteso there are partly and fully automated systems on the market, meeting and exceeding today’s high quality demands at economically reasonable cost. The company pursues innovative processing technologies enabling post-processing of workpieces from serial production as well as cost-efficient cutting processes. 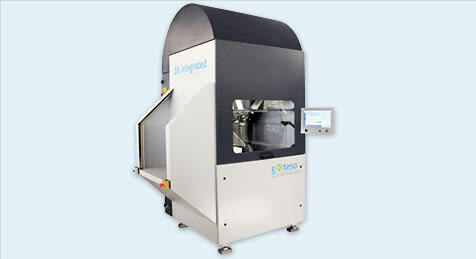 DS integrated by gKteso is equipped with a Bosch-Rexroth control (DIN-programming). The system provides a workspace at a size of 500 mm x 500 mm x 300 mm. Due to the fact that it is completely closed it meets the increased safety requirements. Aside from this, the deburring cell is furnished with an integrated 2-jaw chuck. The maximum velocity amounts to 1 m/s, the repetition accuracy is 0.05 mm and the path accuracy is 0.1 mm. Compared to the base model, DS integrated is fitted with special accessories that reduce the operator’s work and increase the throughput. The automatic identification of components for process reliable post-processing of even mixed origins is part of the special equipment of the DS integrated, as well. You have questions around deburring and the deburring cell DS integrated by gKteso? Then give us a call or write us.